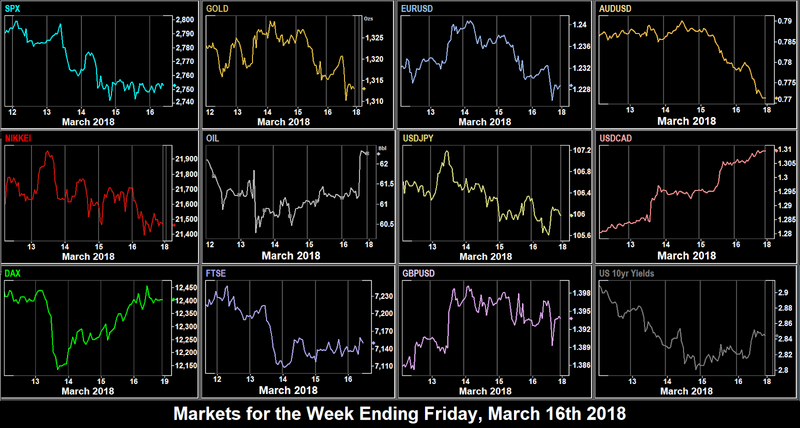 Friday’s indices finished on a high (ie EOD=HOD), so it was no surprise that the rally continued into Monday’s Asian session and briefly into the European day. However, some markets faltered in the US session, and SPX and DJIA closed slightly down as tariff concerns caused money to flow into the tech sector. NDX briefly hit a new all-time high (remember those?) breaching 7,600 for the first time, and closed at 7,588. FTSE and NKY (up in the cash session, reflecting Friday’s US NFP blowout) were down on stronger GBP and JPY respectively. Only DAX managed to hold its own, after some positive changes in the German utilities market. It finished the day roughly flat. Other than the aforementioned pound and yen, the currency and Gold position was generally flat, after a brief dollar rally faded. After a new US 10-year bond auction, which was at a yield of 2.889% (and 2.5:1 oversubscribed), the highest for four years, yields eased to close at 2.87%. Oil gave up Friday’s gains and closed at $61.33. The big news of the day was the dismissal of US SecState Tillerson by the President and markets did not like it, nor were they impressed by US inflation only matching the estimate of 2.1%, and the ‘core’ figure of 1.8% remaining stubbornly below the Fed’s 2% target. All indices were down, in particular NDX (which was retracing the Monday spike) and DAX (which had not reacted the day before). Currencies were very mixed, EUR and GBP were materially up on the Tillerson news, but JPY and CAD were similarly down, although the former recovered somewhat into the close, and then fell 30 points on the BoJ MPC minutes we mentioned last week. GBP was helped by an upbeat Spring statement from UK Chancellor (Finance Minister) Hammond. CAD was hampered by dovish remarks from BoC Governor Poloz at 1415. AUD fell slightly. Clearly not all countries are favoured equally in Trump foreign policy. Gold and bonds (inverse to yields) were slightly on the uncertainty. Oil was very volatile at the US open, rising 1.5% to then fall 2.5% all in a space of 90 minutes. It ended the day down. We said last week that Tuesday’s US CPI was more important than today’s US Retail Sales, but as CPI unusually came in neither a beat nor a miss, the miss today further depressed a market already digesting the Tillerson departure. SPX and NKY were down again (as JPY rose), however DAX and FTSE managed to post a green candle, the former being helped by a retreating euro. Notably MICEX was down nearly 2% following the international condemnation of Russia’s alleged spy assassination with a banned chemical weapon. Currencies continued to follow their own patterns. In general USD was down on the Retail Sales print. JPY was comfortably up, where AUD and CAD recovered only slightly. GBP (and Gold) were flat on the day, holding onto the previous gains whereas EUR did not, after dovish remarks from ECB President Draghi at 0800. Oil reacted logically to the EIA stock miss at 1430, fading 1.3% in an hour, but fully recovering this by the pit close at 1830 and actually closing up. The reaction was not instantaneous, and so was quite tradable. The game of musical chairs continued at 1600 Penn, with Larry Kudlow replacing Gary Cohn as Trump’s economic advisor. Ex-CIA boss Mike Pompeo has been pencilled in as Tillerson’s replacement. Both these are considered to be closer to Trump on policy than their predecessors. US markets were mixed, SPX was more or less flat (down 0.1%), NDX was down 0.2%, whereas DJIA actually rose 0.5%, which was probably a reversion to mean of the flow we mentioned on Monday, as top-weight aluminium consumer BA still fell. In Europe DAX and FTSE were up as EUR and GBP faded. Despite their elevated levels, bond yields reversed and put on 1bp. This was read as anticipation of next week’s near certain rate hike, and USD started to react, and advanced again all major currencies. Gold fell in line. Only, notably, NOK was up on clear pointers to a rate rise soon from NB (after the 0.5% rate was held this time). Oil was slightly up on the day. Friday was monthly Open day. The unsettling US political news continued with rumours that Trump is considering replacing NatSec advisor McMaster, and that special counsel Mueller had subpoenaed the Trump Organisation for documents in his Russia probe. Nevertheless, the equities decline was arrested, as often happens after four days down, and indices were generally flat across the board, with beats on US Capacity Utilisation (1315), JOLTS job openings (1400), and Michigan Consumer Sentiment (1400) balancing the political uncertainty. Yields were up again today, and USD advanced after the solid economic data. Although DXY only put on 0.1%, it finished at a one-week high of 90.20. USD was mixed again. GBP and JPY advanced whereas other currencies and Gold gave up ground. Oil spiked up around 2% during the early US session. In the absence of news, this probably related to traders exiting contracts ahead of the April expiration next week. Another mixed week for USD, retreating against GBP and JPY but advancing elsewhere. The best forex trade would have been CADJPY, netting you 3.1%. The indices were relatively quieter, the best trade being to short SPX. Gold and Oil had flat weeks again. 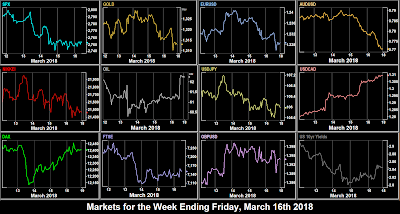 As we go into the penultimate week of the quarter, with the second week of the US/Europe disconnect on Daylight Saving Time, markets are focused on the Fed rate decision. The weekend sees the first round of the Russian Presidential Election. Putin is assured of victory. The G20 meeting starts in Argentina. US TreasSec Steve Mnuchin is attending. On the agenda inter alia is the regulation of cryptocurrencies. UK Brexit Secretary Davis commences two days of Brexit talks in Brussels. ECB Member Mersch speaks at 1800. The main economic release of the day is UK CPI. The April oil contract (CLJ18) expires. In the absence of any US news, price/action during the US session is likely to reflect positioning prior to the FOMC decision the next day. All eyes will be on the Fed rate decision. A hike of 25bp to 1.75% is 94.4% priced in according to CME Fedwatch, so as always, the focus will be on the ‘dot-plot’, the projections of each of the 16 members of the Fed regarding the range of future rate hikes. The UK average earnings print is important, because as we have said many times, the failure of wage growth has been the sticking point, both in the US and UK, that tempers rate increases. In Australia, RBA Boge speaks at ‘FX Week, Australia’ at 0230. The EU leaders summit opens in Brussels, with the Brexit transition agreement to the fore. Also from Europe, ECB members Lautenschlaueger (0830) and Nouy (1000) are scheduled to speak. Together with UK Retail Sales, all this might cause some interesting positioning for the day’s main event, the BoE UK rate decision. A hold is expected, but watch out for a non-unanimous vote, and anything that can be gleaned from Governor Carney’s remarks. BoC Deputy Gov Wilkins speaks later in the day. The second day of the EU summit may produce some Brexit guidance. The Fed blackout is over now, and we have Bostic (centrist, voter) and Kashkari (dove, non-voter) speaking. CBR is expected to cut RUB rates today. Finally, the day marks the end of Trump’s tariff ‘waiting period’. The principal news print is Canadian CPI. Retail Sales is concurrent, but less important as it is only used as a CPI proxy anyway, and the release is only the MoM figure.